I mean, I like them but I'm not sure if I '£8 like' them. What do you think? And if I decide I DO '£8 like' these mugs, do I black, red or orange like them? Found at Utility - thanks to a heads up from RetroToGo. That's like... $15 US dollars, right? Why are reproductions as much, or MORE than vintage? OK, so there are a *few* exceptions, but $15 for a reproduction mug? Nup don't like them. 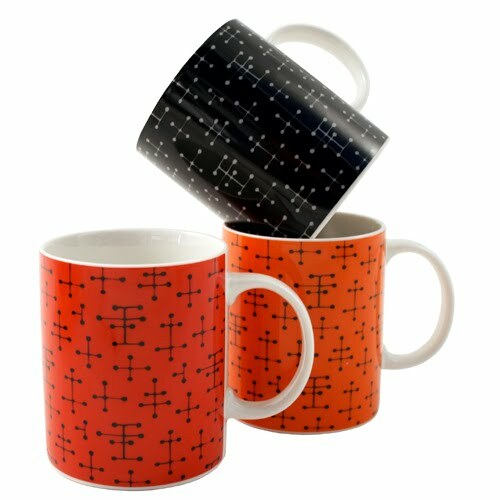 Sure the design "print" is 50s-like but the cup shape reeks of 80s standard mug. I agree with both of you, if they were like £2 - fine. Even £4 - maybe, but not £8. 1950s - those late 60s mugs I like may start off cheap but they skyrocket. Maybe I need to start checking out the US offerings but the postage can be a bit prohibitive. But I DO see an awful lot of the kind of late 1960's-early 70's things you seem to like, for cheap on eBay. Not sure if they each sell internationally or not, you know, you'd have to check each auction. And except for the well-known stuff that always sells for a lot, I see a lot of that ear selling for the cheapest among the mid-century stuff. I really wish my husband liked going to boot sales and the like. They seem to be the only place I get lucky (vintage wise, of course) but I don't like going by myself. Hmmm... love the pattern of course, but the shape seems a bit blah for Eames.